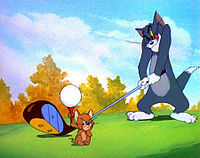 The caption here as copied from Wikipedia: “Jerry is forced to act as tee, moments before Tom’s ball ricochets into his own mouth.” Keep it in mind. 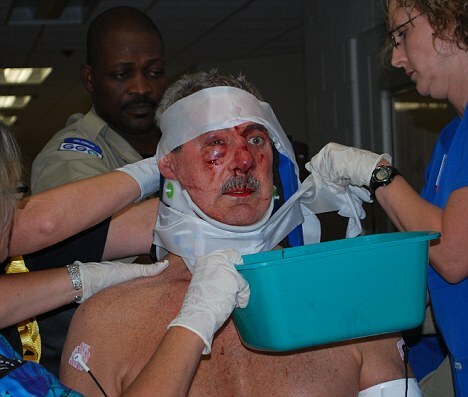 What’s funnier than seeing people behaving in goofy and graceless ways when things go wrong? How about this story, told to me by a still-young guy about the time he went on a kind of bachelor party weekend involving golf? As the young guys prepared to tee off, a lineup of old duffers sat on the wall watching this party of whimsical lads. One of them had brought a bowling ball attached by means of various ingenious gizmos to a heavy metal chain, which he affixed to the ankle of the prospective groom. (The old ball and chain, see.) Somehow they were let onto the course anyway. The teller of this story was maybe 22, and though he was an athletic and well-muscled lad he had never before set foot on a green. He was there with borrowed clubs which he was just then studying fervently in the hope that he might choose one that would let him get the ball to go someplace, anyplace. He chose that jumbo apostrophe of a club called the Big Bertha, thinking its width would improve his chances. Instead, the club took a picturesque kind of revenge both on him and his friend’s kindly father who had lent him his clubs for the day.